If you want to start taking control of your privacy on Facebook – the best you can anyway – you can delete your search history. Here’s how it’s done. Let’s face it. Facebook (and other social networks) is really nothing more than a way to gather your information and sell it to advertisers. Sure it gives you a cool way to interact with your friends and family, but the bottom line is it’s devised to gather as much information about you and your friends as possible. One way it “helps” you is by saving your search history. 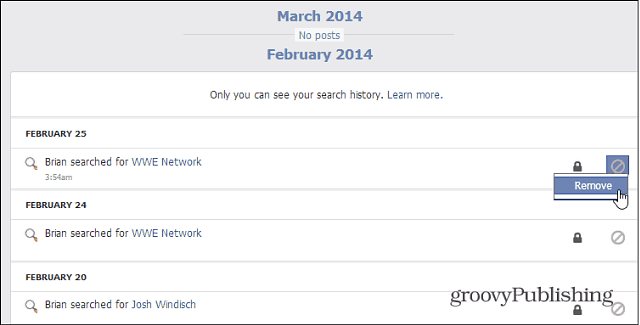 Facebook claims this is to make it easier for you to find what you’re looking for. However, in the background it’s creating a database of your searches and querying things like brands, other people you’re following…etc.. If you want to start taking control of your privacy on Facebook – the best you can anyway – you can delete your search history. Like most Facebook security and privacy settings, it’s not hard to do, but the problem is finding where to do it. 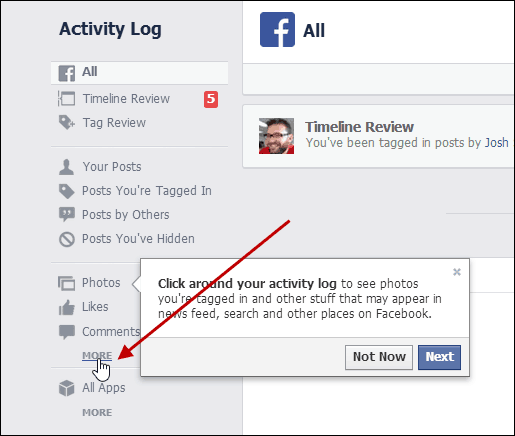 Log in to Facebook and click Settings (gear icon) and select Activity Log. On the next page you’ll see a list of your recent activity on the left. Things like Photos, Likes, Notes, and more. Click More at the bottom of the list. That will open more activity categories on the list. From the bottom of the extended list, click Search. That give you a list of all of your search history. Remove searches by clicking the block icon and then Remove. Then verify you want to remove it. It’s a tedious process as you have to do each one individually. If you’d like to take more steps to protect your security and privacy on Facebook, check out these following articles. 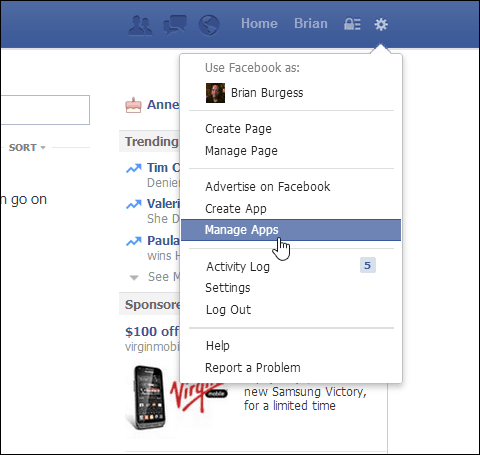 Of course, the best way to block Facebook from having anything about you, then Completely Delete your Facebook Profile. Although, in some unique situations, you might have a Facebook profile and not be aware of it. And now Facebook has no clue (smile) from here on forward because I have removed all that information. @ ChicagoMom: Glad to have helped! When it all comes down to it, free services from Google, Facebook, Twitter, Amazon … etc. The companies give you free cool stuff for your private information. While there’s no denying a lot of it is very convenient and fun, there is a dark side behind the scenes. All we can do is keep ourselves as private and secure as possible. 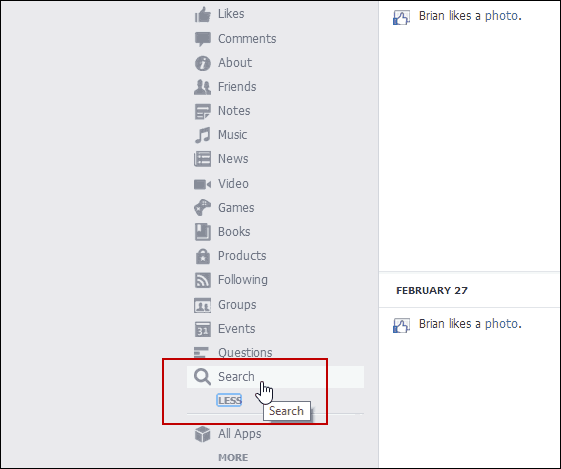 how can I recovery my search in Facebook activity log that I remove theme? that is very important to me how to get them beck. Great post! Who knew? We thought Big Brother disappeared in 1984. Looks like he’s more present than ever. Thank Brian for alerting us. I enjoyed the article and tested out the process, which worked perfectly. Personally, I’m not too concerned about being tracked. But I like to know.